1 of 3 Heat oven to 450 degrees F. Season pork with 2-1/2 teaspoons of the smokehouse seasoning. Heat 2 teaspoons of the oil in large nonstick oven-safe skillet over medium-high heat. Brown pork 2 minutes or until golden. Roast at 450 degrees F for 18 minutes or until internal temperature reaches 140 degrees F on an instant-read thermometer. Remove from oven; let stand 5 minutes. 2 of 3 Meanwhile, in medium-size saucepan, heat 1 teaspoon oil over medium-high heat. Add onion and quinoa to saucepan. Stir in broth, syrup, cranberries, 2 1/2 teaspoons smokehouse seasoning and salt. 3 of 3 Bring quinoa mixture to a boil. Cover; reduce heat to medium-low. Simmer about 20 minutes or until liquid is absorbed. Stir in peas and heat through. 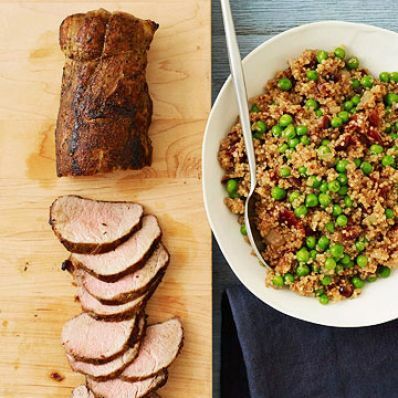 Slice pork; serve with quinoa. Per Serving: 6 g fiber, 14 g Fat, total, 63 g carb., 3 g sat. fat, 96 mg chol., 96 mg sodium, 38 g pro., 529 kcal cal.